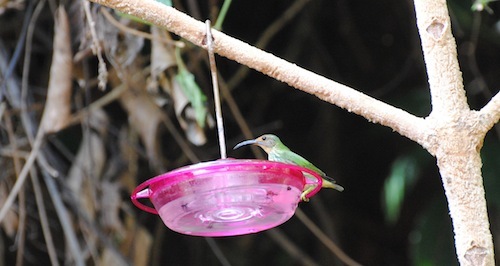 Honeycreeper discovers new food source. Photos by Kenneth Fournillie. In June this year, in their ongoing efforts to introduce new visitors to the Asa Wright Nature Centre, Caligo Ventures Tours brought some special people to Spring Hill. This was a group of professional nature photographers who came to Trinidad and Tobago to assess the potential for serious nature photography in our islands, and especially at Spring Hill. They were very impressed with what we had to offer on the islands and particularly at Spring Hill. One suggestion was made for a sheltered location where serious photography could be pursued. While on the Asa Wright verandah the observer can view the birds intimately, photographers had to share the space with others, including, sometimes, casual visitors. So, responding to this concern, and to create a very special place for the professional nature photographers to work protected from the sun or rain, we searched the surroundings for an ideal site to build acovered Photographers’ Blind. Along with Larry and Mark of Caligo, and with help from Board Member Raymond Mendes, a location was selected at the back of our two cocoa- drying houses. This site, while within the main estate compound, is secluded enough not to attract the average or casual visitor, and thus gives considerable privacy to photographers using the shelter. It was also a place with a great diversity of bird and small animal life – even before we enhanced the surrounding foliage with plants and trees to bring in more birds and animals. 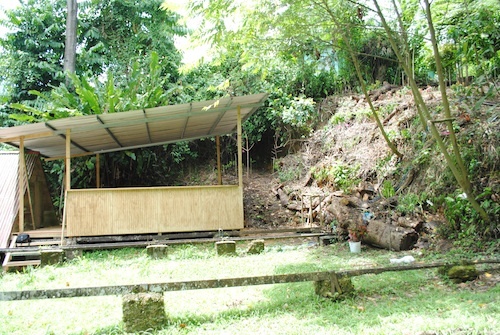 The plywood shelter, built by our maintenance staff, and kindly funded by Board Member Courtney Buechert, measures 16 feet by 20 feet, and is set about 2 feet off the ground on the railings of one of the cocoa houses. It offers three views: to an adjacent flower-covered earth bank where two Mot Mots are nesting; across an open grassed area and into a mix of foliage which has been enhanced to attract more birds. Head Guide Mukesh Ramdass and Gardener Bharath Rambaran selected and transplanted the foliage, and built new feeding stations. These are already attracting a wide selection of birds and small animals. We look forward to seeing the photographs which will be shot from our new and dedicated Photographers’ Blind. "Simple but effective." The new photographic shelter.